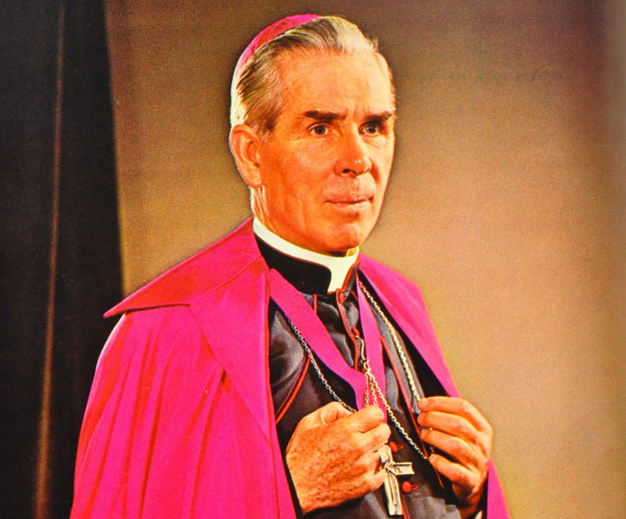 I spoke to Bonnie days before the Vatican announced that its theologians had approved the miracle that occurred in her life, after she sought the intercession of Archbishop Fulton Sheen, the charismatic American televangelist who died in 1979. It is especially cruel when tragedy strikes within seconds of euphoria. Moments after James’s birth, the abundant joy of the previous nine months abruptly died: Bonnie’s baby was stillborn. It was at this point that Bonnie fell into a state shock. Her friend, who was present at the birth, called an ambulance and her husband calmly performed an emergency baptism. At the moment that Travis traced water on his son¹s forehead and baptised him James Fulton, Bonnie’s friend began to pray for the intercession of the newborn¹s namesake. By the time the paramedics arrived there was still no pulse. Bonnie spent the 20-minute journey to the hospital in a separate ambulance from her husband and baby, lying alone, unaware if her son was dead or alive. When they arrived at the hospital it was Travis’s turn to endure a solitary, harrowing wait. He lingered outside the hospital emergency room while doctors desperately tried to resuscitate his baby. Five men eventually emerged with tears in their eyes. “They said to him: ‘Your son is alive’ and Travis understood in that moment that what they were really saying was: ‘He’s alive now but just for right now.’ The fact that they were crying meant that he knew that things were really bad. The miraculous breath had come after 61 excruciating minutes. James had breathed again at the moment doctors gave up their efforts and stopped to record his time of death. Bonnie was able to bring her baby home after seven weeks in hospital. “As he continued I think they gave us an increasingly better prognosis. So it went from very severely disabled to: ‘OK, so he’s going to have cerebral palsy. We just don¹t know what it will look like.’ But he continued to get better and seemed more and more like a normal baby… I mean, there was always some big question marks for about the first six to 12 months just because he was a baby, so we had to wait for him to hit his milestones to know how complete the miracle was. Bonnie still prays to Fulton Sheen and he remains a central figure in her family’s life. I asked her what she most admired about him. “The day he was ordained he made a promise to God that he would keep a holy hour every single day for the rest of his life and he kept that promise,” she says. “So for over 60 years he made a holy hour every single day and that devotion to the Eucharist is really a wonderful example for me. I think it would be a wonderful example to the world, which is why I hope he is a canonised saint. Bonnie also tells me that Sheen heroically carried many burdens, but only confided them to very few people who have refused to speak about them since. When St John Paul II visited St Patrick’s Cathedral in New York City in 1979 he was surprised to discover Sheen was not concelebrating Mass. When Sheen was invited to come forward, the pope embraced him, telling him: “You are a loyal son of the Church.” Sheen died a few months later. “Nowadays if we have a problem with someone we write it on Facebook. But he really bore that internally. So when John Paul II sought him out and embraced him that was a really powerful moment.